The Executive Committee of the Federation of Catholic Bishops Conferences of Oceania (Australia, New Zealand, PNG/SI, CEPAC) is currently meeting in Port Moresby, Papua New Guinea. We come from a multitude of island nation States spread throughout the Pacific. We are delighted to be here in PNG and have enjoyed greatly the wonderful hospitality of this vibrant nation. It was an honour for us to meet with the Hon. Powes Parkop, Governor of Port Moresby, and we all offered him congratulations and encouragement on the development of this city and his commitment to justice, integrity and service in civic leadership. Though we come from diverse cultures and regions, as Pastors and Shepherds our hearts are united in the desire to seek what is best for the human family and the common good of any society. Indeed our faith, following the example of Pope Francis, prompts us to see the world firstly not as a global market but as a universal home. Last year, we urged governments and businesses to support the Paris COP21 initiative addressing issues of climate change and sustainable development. We are therefore heartened to see that the PNG government has recently passed a Bill agreeing to implement the strategies of that initiative. Responsible use of the environment and resources is a duty and task for everyone. The Clean Generation Campaign, which we have come to know about here in PNG is an inspiring example of local initiative among the young. Also we have learned of those working to support coastal communities who wish to raise their voice against Seabed Mining. Far from being “anti-development” such communities wish to pursue sustainable development including family friendly tourism, fisheries and agriculture. What kind of trade agreements permit foreign companies to engage in practices and processes which in their own country are illegal? The sea is a treasure for all and should never become a “playground of exploitation”. A particular focus of our current gathering is the people of West Papua. They seek what every family and culture seeks: respect of personal and communal dignity, free expression of one’s aspirations and good neighbourly relations. Political boundaries can never contain or control ethnic relationships and so we urge governments to support the West Papuan people’s desire to participate fully in the Melanesian Spearhead Group (MSG). Therefore, we wish to support the 2003 joint interfaith declaration ‘Papua Land of Peace’. Blocked participation in MSG is a wound in the side of all Melanesians. For West Papuans, the MSG is a natural place of collaboration and a potential source of deeper regional understanding. In that regard we wish also to acknowledge the assistance of Indonesian authorities in making possible a recent visit of PNG and Solomon Islands Bishops to Jayapura in order to meet with their brother Bishops in West Papua. Such visits are always for the cause of peace. Finally, we once again echo the international outcry at what is happening to asylum seekers on Manus Island and Nauru. Callousness can never be the proper response to human tragedy. We applaud PNG’s Supreme Court’s decision that the Manus Island detention centre is unconstitutional and illegal and we trust that the Australian and other authorities will act swiftly in implementing a humane plan of rehabilitation for the detainees. ACBC – Bishop Robert McGuckin (Deputy President) Bishop of Toowoomba, Australia and Bishop Vincent Long OFM Conv, Bishop of Parramatta, Australia. CEPAC – Archbishop Michel Calvet SM, Archbishop of Noumea, New Caledonia and Bishop John Bosco Baremes, SM, Bishop of Port Vila, Vanuatu. 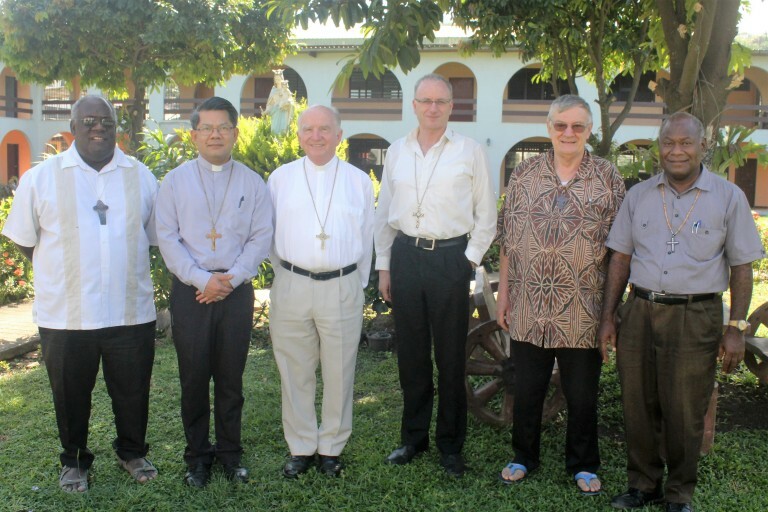 In the Photo above: Left to right: Bishop John Bosco Baremes, SM, Bishop of Port Vila, Vanuatu, Bishop Vincent OFM Conv (Parramatta), Bishop Robert McGuckin (Toowoomba), Bishop Charles Drennan, Bishop of Palmerston North, New Zealand, Archbishop Michel Calvet, SM, Archbishop of Noumea, New Caledonia and Archbishop John Ribat MSC, Archbishop of Port Moresby.